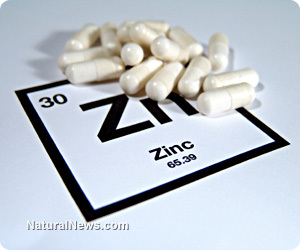 (NaturalNews) Did you know that a zinc deficiency can cause over twenty health related issues including cancer, Alzheimer's disease, infertility and Crohn's disease? An often overlooked mineral, zinc plays an important role in a wide range of functions, such as DNA repair and immunity. It's also an essential nutrient for the prevention of the flu and colds. Luckily, a variety of foods are rich in zinc and several methods are available that enhance absorption. Research at the Linus Pauling Institute (LPI) in Oregon found that zinc deficiency is a widespread issue and can lead to inflammation, decline of immunity, cancer, diabetes, heart disease and autoimmune disorders. It is estimated that around 40 percent of elderly Americans and up to two billion people worldwide are deficient in the micronutrient. "The elderly are the fastest growing population in the U.S. and are highly vulnerable to zinc deficiency," said Emily Ho, an LPI principal researcher and associate professor. "They don't consume enough of this nutrient and don't absorb it very well." "We found that the mechanisms to transport zinc are disrupted by age-related epigenetic changes. This can cause an increase in DNA methylation and histone modifications that are related to disease processes, especially cancer. Immune system cells are also particularly vulnerable to zinc deficiency." Similarly, research published in The Journal of Nutrition states that 12 percent of Americans do not consume enough zinc. The in vitro studies reveled zinc depletion increases oxidative stress and hinders DNA repair. And the publication Biological Trace Element Research found that low zinc levels are directly linked with depression, while a study in Molecular and Cellular Biochemistry discovered adequate zinc prevents osteoporosis. The end conclusion of these studies? Sufficient zinc consumption and proper absorption are absolutely essential for good health. As we age, it becomes more difficult to absorb zinc properly. Vegetarians are also at risk due to the fact that meat provides a highly bioavailable form of the mineral. Chicken, beef and seafood are the best sources, especially oysters. Vegetarian diets also tend to be high in zinc blocking phytates found in grains, legumes, nuts and seeds. Research has shown that fermenting whole grains, as in traditional sourdough bread, significantly increases zinc absorption. Soaking beans, nuts and seeds assists in the bioavalibility of the mineral too. An interesting study in Mexico found that, when vegetarians consumed one cup of milk or a half cup of yogurt twice per day with meals, zinc absorption was 50 percent higher in the milk group and 68 percent higher in the yogurt group. Additional food-based sources of zinc include lamb, turkey, crimini and shiitake mushrooms, asparagus, chard, pumpkin and sesame seeds, miso, spinach and spelt. Since overconsumption of zinc can cause deficiency in other nutrients such as copper and calcium, using zinc supplements is not recommended unless under the guidance of a qualified health care practitioner.